Reading Art: Maugham's Chardin: Eureka. Please read 'What's in a still life' on the same subject. In W. Somerset Maugham’s novel Christmas Holiday (1939), Charley and Lydia, the two main characters, discuss a still life by Jean-Siméon Chardin in the Louvre. Charley, who had thought of himself as an expert, suddenly discovers a whole new dimension to Fine Art, that until then he hadn't been aware of. 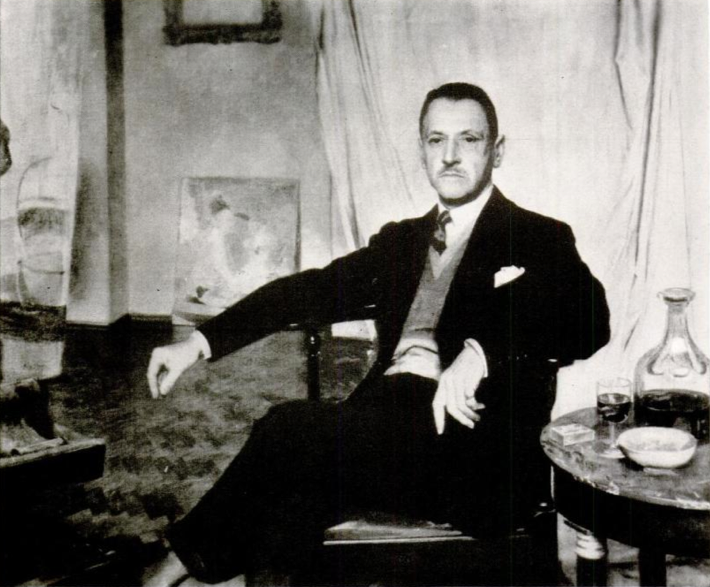 Maugham in 1933, with a flagon of wine. Maugham is at his best in this scene. He gives a wonderful philosophical interpretation of a simple arrangement of a loaf of bread and a flagon of wine. Read the excerpt from the novel in my previous post. I tried to identify which of Chardin’s many still lifes they were talking about, but couldn't. Some are close to Maugham’s description but don't quite fit. There is a festive one, with a twig of fleur d’orange in a brioche in the Louvre and there is another, where wine and bread are next to a plate of leftovers from a poor man’s meal. 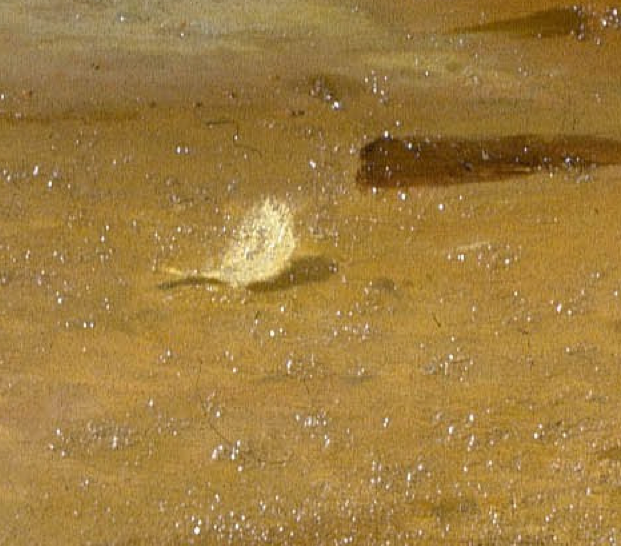 The second one is not in the Louvre but in the Lille museum of Fine Art. And neither corresponds exactly to what the characters are talking about, bread and wine as the flesh and blood of the common folk, despised and rejected. In desperation I appealed to friends on social networks — and it worked! First, an old colleague of mine, journalist Vladimir Solntsev suggested that a completely different picture, not in a French collection but in the National Gallery in London, best fitted the description. I looked at it in disbelief — it did. Then came the final breakthrough. Natalia Fedorchenko found an old article in Life magazine, by none other but Maugham himself, confirming that it was indeed the picture in the novel. In that article, published in December 1941, he also repeats, practically word for word, the interpretation he put in the mouth of his character and explains how he used ‘novelist’s licence’ to move Chardin’s still life, for the story’s purposes, from the National Gallery to the Louvre. There is a small disappointment, however. The National Gallery website states that the painting is now considered to be not by Chardin but by a later, 19th Century imitator. Apparently, at the time Maugham was writing, it was still attributed to Chardin. My thanks go to Natalia and Vladimir who helped solve the mystery that wouldn’t let me sleep in peace for many a night. And what a wonderful trick by the old master, one of the best interpretators of art in the past century. The portrait above is by Maugham’s friend Sir Gerard Kelly (wiki article), who painted at least eight portraits of the writer and appeared, under different names, in several of his novels. The picture accompanies the Life article, but there is no indication of the source or the copyright status of the work. I couldn’t find it anywhere else on the web and publish it now on ‘fair usage’ basis but please let me know if you know who owns it and I will put a proper attribution. Here is an excerpt from the Life article, ‘Paintings I have liked. A great novelist tells of his experiences with another art,’ from Life, December 1, 1941. I saunter on, looking for my favorite Chardin, but I know I shall nor find it, for it is not in the Louvre, but in the National Gallery in London. Chardin by many people is looked upon as one of the lesser masters. I do not think he is. For one thing he was eminently skilful. He had a wonderful talent for putting onto canvas the play of light and the savor of color and because he liked to do this he preferred to paint still life which he could arrange as he chose. He was a very even painter and I cannot think of a single one of his pictures in which he falls more than a little below his own high level. Now and then he painted domestic scenes, women at heir chores, because he had to sell to eat, and it appears that people would not buy his still lifes. The patrons of his day asked for the human interest; it is strange that they did not see that the significance of his still lifes consists not only in their lovely harmonies and in their exquisite delicacy but precisely in their human interest; for Chardin’s peculiar virtue is that he was able to see the beauty and the throbbing life that there is in humble ordinary things like pots and pans. You cannot believe he painted them merely because he could make a decorative arrangement of them and a delicate harmony of color; had that been all, he could hardly have painted them with such tenderness, and you cannot resist the conviction that they were to him somehow symbols of the pathos and the pity, the courage, the endurance, the goodwill and the honesty of the common people. Some time ago I wrote a novel in which I had occasion to make a character, a Russian refugee, speak of a particular picture of Chardin’s; it happened to be the picture in the National Gallery in London which I have just mentioned, but that did not suit me and so, taking the novelist’ license, I feigned that it was in the Louvre. I put into as apt words as I could exactly the feeling it gave me and since I can express no better what I look upon as Chardin’s deep significance I shall take leave now to repeat them. It is a tiny canvas on which are painted a loaf of bread and a flagon of wine. And isn’t it wonderful, I make my character say, that with those simple objects, with his painter’s exquisite sensibility, moved by the charity in his heart, that funny, dear old man should have made something so beautiful that it breaks you? It was as though, unconsciously perhaps, hardly knowing what he was doing, he wanted to show you that if you only have enough love, if you only have enough sympathy, out of pain and distrust and unkindliness, out of all the evil of the world, you can create beauty. It’s not only a loaf of bread and a flagon of wine; it’s the bread of life and the blood of Christ, but not held back from those who starve and thirst for them, and doled out by priests on stated occasions; it’s the daily fare of suffering men and women. It’s so humble, so natural, so friendly, it’s the bread and wine of the poor who ask no more than that they should be left in peace, allowed to work and eat their simple food in freedom. It’s the cry of the despised and rejected. It tells you that whatever their sins men at heart are good. That loaf of bread and that flagon of wine are symbols of the joys and sorrows of the lowly and meek. They ask for your mercy and your affection; they tell you that they’re of the same flesh and blood as you; they tell you that life is short and hard and the grave is cold and lonely. It’s not only a loaf of bread and a flagon of wine; it’s the mystery of man’s lot on earth, his craving for a little friendship and a little love and the humility of his resignation when he sees that even they must be denied him.